My paintings aren't about the other world. They're about our place in this world. What nourishes the soul is the experience of being in the body. Image size: 14¾ x 22"; paper size: 26 x 32". Edition 20. Image size: 12 x 12¾"; paper size: 24½ x 24¼. Edition 20. Image size: 18 x 18"; paper size: 30¼ x 29¼". Edition 20. Image size: 12 x 37½"; paper size: 23 x 47½". Edition 20. Image size: 12½ x 8¼"; paper size: 23½ x 18¼". Edition 20. Image size: 20 x 20½"; paper size: 32 x 31½". Edition 10. Image size: 20 x 20½" ; paper size: 32 x 31½" . Edition 10. Image size: 20 x 20½"; paper size: 32 x 31½. Edition 10. Image size: 20 x 20 1/2"; paper size: 32 x 31 1/2". Edition 10. Image size: 4 x 13"; paper size: 20 x 30". Edition 20. Image size: 6 x 19½"; paper size: 16½ x 30". Edition 20. Image size: 13¾ x 21"; paper size: 25½ x 32". Edition 35. Image size: 16 x 26"; paper size: 28½ x 38". Edition 35. Image size: 8½ x 11"; paper size: 16 x 20". Edition 50. Image size: 21¾ x 14¼"; paper size: 34 x 24½". Edition 30. Image size: 6 x 12¾"; paper size: 15 x 21". Edition 20. Image size: 18½ x 18½"; paper size: 31 x 29½". Edition 30. Image size: 11¾ x 37¾"; paper size: 22¾ x 48¾". Edition 30. Anne Appleby has been exhibiting her paintings since she received her B.F.A. in 1977 from University of Montana, and her M.F.A. from the San Francisco Art Institute in 1989. Before moving to San Francisco, Appleby spent a fifteen year apprenticeship with an Ojibwe Indian elder in Montana. From him, she learned her patient observation of nature. Although Appleby’s paintings are composed of abstract panels each essentially a single color, she thinks of them as landscapes. She carefully observes specific plants or seasons and uses their colors as they grow and change in works that are particular to them. “As I work, I develop an inner dialogue about the meaning of what I’m doing,” she says. “But I can’t paint that. I can’t even speak it. It’s denser than my activity.” What she does paint is glowing fields of color that seem as alive as the plants she speaks of in her titles. Anne Appleby currently splits her time between San Francisco and her home on the edge of a national forest in Jefferson City, Montana. She has participated in group exhibitions in institutions such as the Tacoma Art Museum in Washington, the American Academy in Rome, and the San Francisco Museum of Modern Art, where in 1996 she was awarded the SFMoMA SECA Award. She was also the 1999 recipient of the Biennial Award from the Louis Comfort Tiffany Foundation in New York. Appleby shows her paintings at San Francisco’s Anglim Gilbert Gallery. 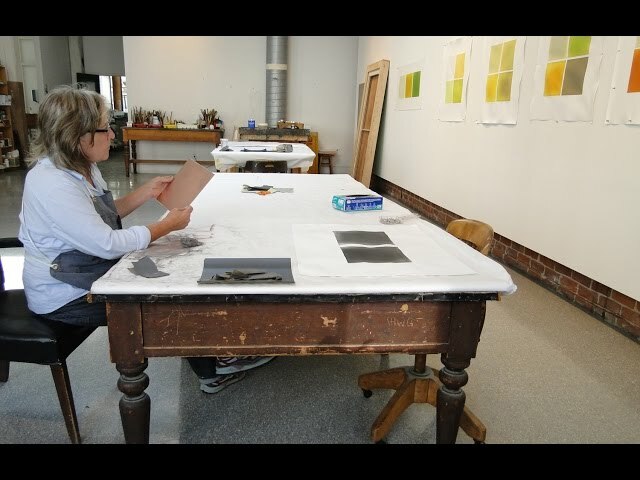 Artist Anne Appleby working at Crown Point Press in San Francisco, 2012.